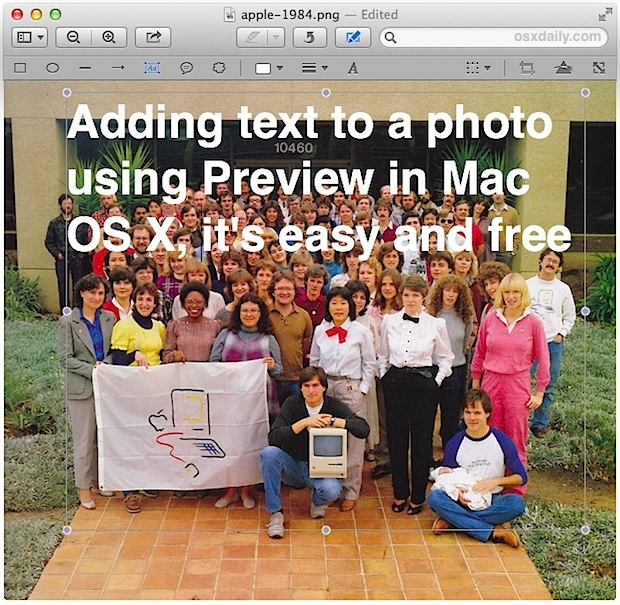 Adding text to images is a fairly simple process to begin with that is made even easier with Preview, the basic image viewing app that is bundled on all Macs. Most people don’t think of Preview when they think of making adjustments and edits to pictures like this, but it works just fine, and because Preview has shipped with every version of Mac OS X from the dawn of time, you’ll never have to download a third party app to just place some words onto a photo. This allows you to place text, words, phrases, and characters onto any image file that can be opened in the Preview app, from JPEG, PICT, GIF, PSD, PDF, TIFF, and many other image file formats. 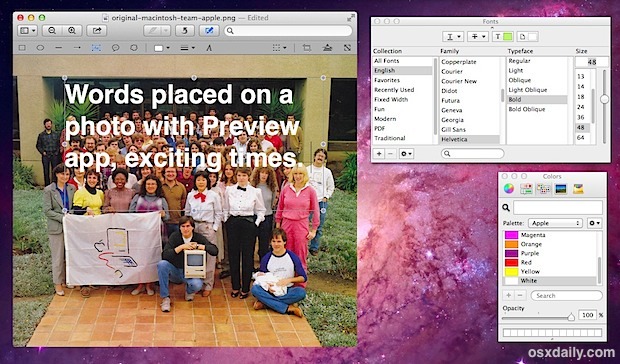 If you’ve never delved into Preview’s font and text tools, here’s how to use them. How this looks depends slightly on the version of Preview running on the particular version of Mac OS X. Don’t worry, we’ve got both covered. Once the text is placed, you can move it around just by grabbing it with the cursor. When finished, save the photo as usual, or use “Save As” or “Export” to create a new file with the text placed on the image. You can also use Preview to add cartoon style speech bubbles to pictures if you feel like going with a more goofy look. Preview is pretty decent but if you’re looking for more options for stylizing the text you’ll need to turn to third party applications. Interestingly enough, you can’t add words or text to pictures with iPhoto, at least with the current versions, though that may change in the future. One simple and free third party solution is to use Skitch, which offers a few more text styling options like outlined text, or better yet, go all out and buy an app like Pixelmator, which is a full-fledged image editor and Photoshop competitor at a fraction of the cost ($15 as of writing). The show edit tool bar and text tool are not active when I bring up an image in preview. Ideas on how to turn them on? I’m having same trouble as Lisa H. I’ve spent 45 minutes trying to get your instructions to work. I’ll think twice after this trying to get any help from osxdaily. Step 2 shows revealing the toolbar, this is an essential step otherwise the Text Tools will not be visible. 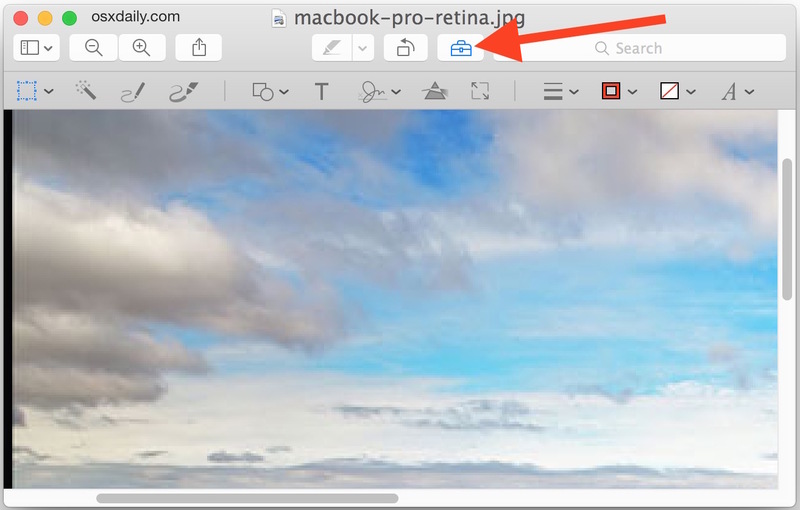 You can also choose “Show Edit Toolbar” from the VIEW menu in Preview. Of course this is in new versions of Mac OS X, if you’re on a very old unsupported version it may be different. What are you running? Actually.. that was BRILLIANT solution.. some of the wording is a different on my Mac but I used my common sense and worked out the ‘annotate’. Text.. Speachbubbles.. all sorts of loveliness. So.. well done.. OSXDaily for helping where two days of searching ‘forums’ etc yielded nothing. I was just about to download some Picasa type crap but.. now I don’t have to. How do you delete a text box in Premiere? What if you’ve already “Xed” out of it and you want to delete it. You cannot select it. With the text tool selected, every time I try to type I get a beep & it doesn’t do anything…help please? I have the latest OS and using Preview to add text to an image file is done by opening Tools on the top Menu Bar and selecting Annotate from the drop down list. The Annotate tab has selections such as Text or Speech Bubble to achieve what you want, plus basic shapes and signature. I have OSX Yosimite, 10.10.1 . Awesome, MjMcGillicuty ! Thanks so much. I would have never figured this out on my own. Works like a charm. Thank you, I found your directions to be easy to follow. I was looking for an app to write on photos and did not know I already had one! Thanks again you were very helpful. I used this feature and it was beautiful. But when I print anything from preview they look horrible. The photos with text had lines through them! This works Great! Can you remove the type once it’s saved? How do you do it? Thanks. Hi, have followed the comment trail with interest…. but think I may be missing something. Currently using OS X YOSEMITE and Photos. On clicking a chosen picture (from the library) to annotate, then “edit”, “show edit tools”, there no text option. Only enhance, rotate, crop, filters, adjust, retouch and red-eye visible. I was seeing exactly what you saw and your comment made me feel like i wasn’t totally losing it! (how could this be so hard?) Then for some reason I decided to try to open photo’s, and drag the photo icon of the photo I wanted to add text to, onto the desktop. THEN (this is where the magic FINALLY happened!) when I opened the photo from the desktop instead of inside photo’s… THERE was the little tool box icon and when I pushed that, there were text options. Hope this helps someone else! What you are describing is editing the picture using Photos. This article describes the procedure for adding text using Preview – which works! Turned on preview first time it came up with all my saved pics. You are right this was a very simple way to add text to a photo, and your explanations were so easy to understand. I just have a tiny little glitch; I wanted to write my text in chinese, you know with the graphic chinese symbols; and even though I have a few chinese fonts listed in my font book, when i click on any of the chinese fonts I get the text in english. I was wondering if you know how to fix that. I have a MacOS Sierra. The text box that you type your text in relocates its position each time you add something to the photo. If you have much text to add, the text box will move off the photo and out of sight so you do not have a text box to use. When I save the photo then re-open it, the text box starts in the center of the photo once again. But, will still move off and out of sight when much text is added. How do you keep the text box in use? How do you delete prior text which has been added to a photo. Such that I can correct and add new text.